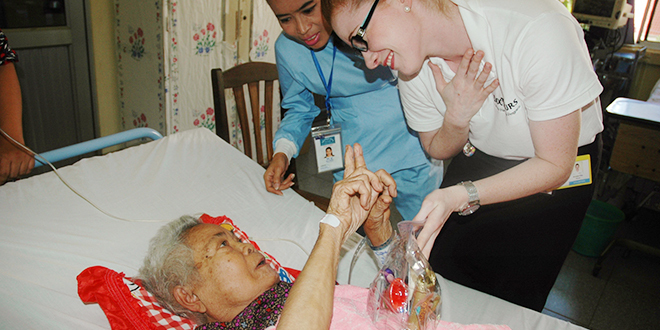 Reaching out: Catholic Education Week ambassador Annabel Pike delivering more than 130 personal care packs to the “poorest of the poor’” in a Cambodian hospital. CATHOLIC Education Week ambassador Annabel Pike has continues her works of generosity. Last week Ms Pike delivered more than 130 personal care packs to the “poorest of the poor’” in a Cambodian hospital thanks to the generosity of Catholic school students in Toowoomba diocese. The 2012 Australian Nurse Graduate of the Year, Annabel travelled to Cambodia to help train and mentor nurses at Sihanouk Hospital in Phnom Penh. On learning of her plans, students from Toowoomba Catholic school communities made up the personal care packs during Catholic Education Week in late July. These packs were shipped to Cambodia to coincide with Annabel’s arrival at the hospital where she will work for three weeks. “While a simple gesture by our standards, words can’t express how grateful these patients were to receive these care packs,” Ms Pike said from Phnom Penh. “They are literally Cambodia’s poorest people. They are interviewed at the door of the hospital to determine their extreme poverty before being seen by a doctor or nurse. “We may not speak the same language, but a smile is universal, and on receiving these care packs, we understood each other perfectly. “Tears were shed, emotions flowed and friendship and trust was built in spades. Toowoomba Catholic Education Office director John Borserio after hearing the response of the Cambodian people to these small gifts, said it reinforced that the small things we did could be big things for others in ways that we didn’t understand. Queensland Catholic Education Commission executive director Mike Byrne praised the students for their support of Ms Pike’s work. “I commend the initiative and generosity of the staff and students involved,” he said. Ms Pike has overcome profound deafness and is a valued member of the Intensive Care Unit staff at the Mater Private Hospital, Brisbane.